If you want the best control and customization options, then WordPress might be the site builder for you. So someone told you to use WordPress for your business website, and you dutifully plugged “wordpress review” into Google (or Bing; we don’t judge) and ended up here. Well, we hate to break it to you, but that person probably meant you should use WordPress.org, and this review is about WordPress.com. Sorry, let’s translate that: WordPress.org is an open source software, but you likely mistook it for WordPress.com, the website builder slash hosting company built on WordPress software. But since WordPress.com offers an all-in-one website solution that includes the WordPress.org software, maybe it’s the better service for you anyway. You can find out for sure with this review. Start by checking out how we built a WordPress website in the video below, then keep reading to find out when you should build your business website with WordPress.com—but also when you shouldn’t. Let’s clear up the confusion right now. People often talk about WordPress.com and WordPress.org pretty interchangeably, but, as we just mentioned, they are not the same thing. WordPress.org is a free software you can use to build websites. It works with just about any web hosting service. WordPress.com, on the other hand, is a bundled website builder and hosting service that uses WordPress.org’s building technology. It offers several paid plans. As another key difference, WordPress the software allows you to customize your site with plugins and CSS (code that changes your site’s appearance). WordPress.com restricts these abilities on its lower-tier plans. But mostly you just need to know that this review is about WordPress.com. So when we say WordPress in this review, we mean WordPress.com unless otherwise specified. Got it? Good. Which of these sounds the most like your business and its website needs? You just need a small, basic homepage for your brick-and-mortar business. You want a small, simple online store that’s easy to update. You have a blog as a business and need to control every detail of your website. You have a large online store and want more flexibility than BigCommerce and Shopify offer. If you answered A or B, then WordPress probably isn’t right for you. It can build those kinds of websites, sure, but other builders (like Wix or Squarespace) can do it faster and more easily. But if you answered C or D, then you really can’t beat WordPress. Because here’s the thing: with enough time and know-how, you can make WordPress do just about anything you want. WordPress.com has been around since 2005. The site is owned by Automattic, a company founded by one of the original developers of WordPress.org. For example, you might start with WordPress’s visual builder, which allows you to create and edit content blocks with the click of a button. But if you don’t like the way things look, you can go buy a new theme (you have thousands of options). And if your new theme isn’t quite right, you can edit your site’s code to tweak it. Once it looks the way you like, you can get some plugins that add additional features to your site. These abilities make WordPress virtually limitless in terms of customization. You can make your website look any way you want and do anything you want—but it will take some effort. In fact, to get the most out of WordPress’s customization options, you’ll want to learn some CSS, thoroughly research your plugin options, and invest some quality time with your website. You can make your website look any way you want and do anything you want—but it will take some effort. You’ll also want to get WordPress’s Business plan. We’ll explain this in more detail later, but the Business plan is the only one that gives you access to all the defining features of WordPress the software: plugins, SEO tools, and CSS customization. The other plans lack those vital features—and at that point, you might as well go with a drag-and-drop website builder like Wix to build your site faster and more easily. But if you want complete control over your website, and you’re willing to invest some time and energy, then WordPress.com provides an all-in-one hosting provider and website building solution you’ll love. Wondering how we know all this? We tested WordPress and eight other website builders to compare their features. Here’s how our WordPress test went. We’ve mentioned that WordPress is an excellent option for some businesses. But how do we feel about it when all’s said and done? 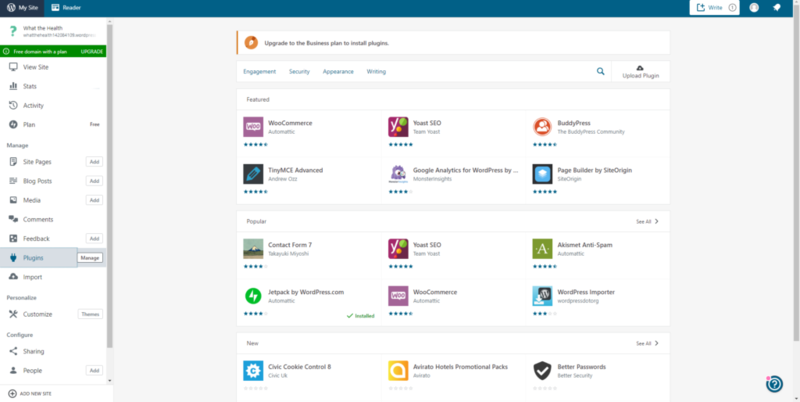 Well, just check out how we scored WordPress on usability, design, and customization. We gave WordPress a low usability score because, despite what some people will tell you, it really doesn’t feel that easy to use. Sure, over time you get used to the platform and can easily find your way around, but first you have to get over a steep, steep learning curve. Take the dashboard menus, for example. It can be confusing to know where you go to edit things. Like with our homepage—it really threw us off trying to remember where on the menus we could edit it (under Customize, in this case, instead of Site Pages). Then there’s the actual building process. WordPress’s block elements make it simple to create good layouts, but it still takes a lot more work than using the pre-built blocks (with images, headings, and text pre-arranged) of other builders. Plus, the editor feels clunky; it often took us a lot of random clicking around to select the exact element we were trying to edit. Of course, WordPress also makes you get plugins to add features that other site builders have built-in—like a store. That means more work on your part, from finding the right plugin to installing it to learning how to use it. And as we noted earlier, you’ll need at least some coding knowledge to really maximize your WordPress usage. To truly customize your theme—like choosing the hover color of your buttons or changing the border on your featured images—you should have a working knowledge of CSS. You can pick up that knowledge pretty quickly with some simple Google searches, but that’s way more work than other builders require. So no, WordPress doesn’t feel especially easy to use at first—but that shouldn’t necessarily keep you from using it. As you get to know WordPress better, your experience will improve. And again, what it lacks in usability, WordPress more than makes up for in customizability. If you really want control over your website, WordPress is worth the struggle. We’ll be honest: we struggled with the best way to rate WordPress’s design. As we keep saying, with enough time, you can make your WordPress website look incredible. Many of your favorite websites run on the WordPress software precisely for that reason. With that in mind, we could have given WordPress full marks on design. In the end, though, we scored it based on our building experience, because that feels more authentic to the kind of experience you’ll probably have when you start with WordPress. And in our experience, our WordPress site had good, not great, design. Much of the design came down to our theme, which we really liked. With a splashy home page and clean, clear navigation, it gave our website just the kind of trustworthy, modern appearance that we wanted. But of course, a different theme could have made our site look completely different. Fortunately, WordPress has plenty of nice themes to choose from. Nearly all of them feature mobile-responsive designs, and they mostly have clean, readable layouts. So even with a different theme, we probably would have liked our basic design. So what was the problem? The pages we built. As we mentioned before, the blocks in the visual editor don’t come with any design elements (like a bold background, shaped crop for images, etc.). We assembled our blocks to look orderly and neat, but they also look pretty basic and boring. Not bad enough to drive away customers, but not good enough to really impress us either. In the end, we felt our design really could have been great, but as it was, it was just okay. We worried about how to rate customization too. With our free plan, customization options felt somewhat limited. We only had a few choices for site color schemes, for example. Sure, we could change the layout of our pages with blocks, and we could change the font size and color in those blocks, but the visual builder felt more restrictive than a drag-and-drop builder like Wix. But when it comes down it, we recommend you get the Business plan. You are, after all, a business owner, and that plan has vital features you’ll want (more on that coming up in a just a minute). And the Business plan definitely earns full marks on customization. 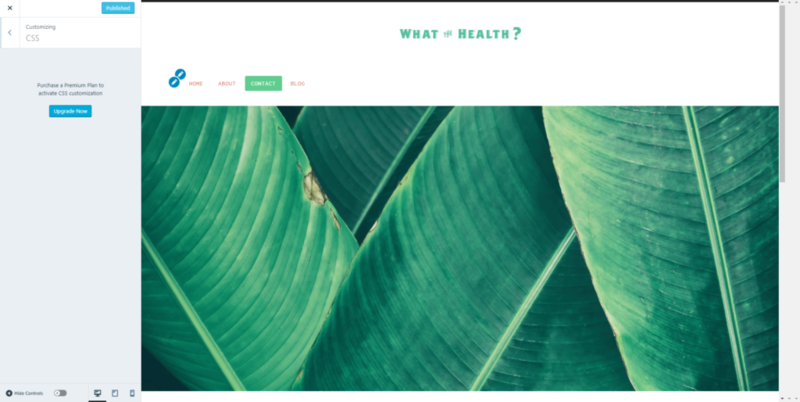 With the Business plan, you can inject custom CSS code into your website to change colors, link hover behaviors, alignment, menu appearance, and pretty much anything else you can think of. You can use plugins to add more functionality to your site, whether that’s e-commerce or forums or music hosting. Plus, you can upload your own themes, which means you can create a theme or buy one from somewhere like ThemeForest. That gives you access to thousands of themes. With those abilities, it’s hard to imagine a website builder more customizable than WordPress. Check out the table below to see how WordPress compares to some of the competition. As we’ve mentioned a few times now, you’ll see that you need the Business plan to unlock WordPress’s best features. 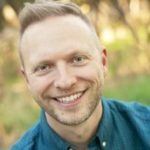 But how much will WordPress actually cost you? Well, as with most things, that depends. As we noted earlier, we used the free plan for our website build. While it does allow you access to the WordPress builder, we really can’t recommend it for business use, if for no other reason except that the free plan will include WordPress ads on your site—not a good look when you’re trying to get customers to focus on your business. Also, free WordPress websites have URLs like yourbusinessname.wordpress.com, rather than simply yourbusinessname.com. Not a very professional look. So realistically, you have three options: the Personal, Premium, and Business plans. These plans vary pretty widely in their abilities, so the right choice for you will depend on your business needs. Realistically, most businesses will want the aptly named Business plan. It’s the only plan that gives you access to plugins and vital SEO tools. With these features, you can make anything from a robust e-commerce site to a content-heavy recipe blog, and you can make sure customers can find you through search engines. 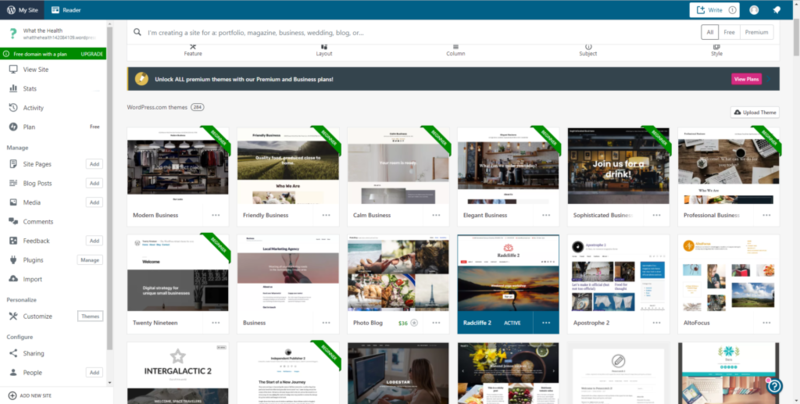 Plus, the Business plan lets you upload your own WordPress themes (like those you can buy from ThemeForest), and it works with Google Analytics so you can see how your site is performing. It also comes with unlimited storage, so you can upload all the item pictures or weblog videos your heart desires. So let us be clear: we recommend the Business plan. With any other plan, you’re losing out on WordPress’s most valuable features—and at that point, you should go with an easier builder like Wix. But maybe you want to know about your other plan options, just in case. While we don’t recommend these plans, they certainly can work for some small-business websites. The Personal plan has some severe limitations: you can’t use any plugins, you can’t customize your website’s appearance much, and you can’t even add a PayPal button to accept payments. It also has the most limited storage. Still, if you just need a very simple website—an author homepage, perhaps, or a basic website for your HVAC business—the Personal plan lets you make one on the cheap. With the Premium plan, you get more storage and more customization options (like the ability to change your site’s CSS). It also gives you Premium themes, so you have more choices for out-of-the-box design. You can’t add plugins, but you can add a PayPal button. So if your pet taxidermy business only has a few sales each month, or if you just want more control over your freelance writing business website, Premium could work. You’ll also need to consider a domain name. All three plans—Personal, Premium, and Business—come with a free domain for one year. After that, you can get a domain name from one of our favorite domain registrars. Here’s the thing: the SEO features on the Business plan are fantastic, some of the best out there. That means you can increase your odds of getting found by potential customers googling businesses like yours. The SEO features on any other plan? Mediocre, at best. Some customers have even accused WordPress of artificially restricting its SEO abilities on lower-tier plans. For reference, when we asked our own SEO specialist to rate the SEO abilities of all the site builders we tested, he gave WordPress’s Business plan a five out of five. For WordPress’s other plans, he dropped the score to a three out of five—worse than builders like Wix or Squarespace. That’s because WordPress’s Business plan is the only plan that gives you access to essential SEO features, like custom title formats and meta descriptions. Likewise, only the Business plans let you add plugins, which can provide more advanced SEO features, like XML sitemaps and breadcrumbs (directories that help search engines catalog your site and navigational links that tell users where they are in your site, respectively). So if SEO matters to you because your business relies on getting lots of traffic—like a mommy blog or a fashion blog—then WordPress is a great choice. Just make sure you pony up for the Business plan. Because we used the free plan, we couldn’t interact with WordPress customer support. That privilege is reserved for paying customers, apparently. But as a paying customer, you’ll have access to email and live chat support. For Business customers, you can chat with support 24/7. Other customers are limited to 24/5—no weekend support. Of course, aside from billing issues, you might never need to contact WordPress support. WordPress has extensive help articles on its support page. Plus, it has ultra-active support forums where you can seek help from other WordPress users as well as developers and staff. We know that forums usually sound like a last resort, but take it from us—these support forums have some serious chops. If, say, you have a question about customizing the hover appearance of navigation links on your site, you can expect someone to reply with CSS code snippets you can use to fix the problem. And don’t worry, they can help with basic stuff too, like changing your font colors. But enough about our feelings on WordPress. How do actual customers feel? 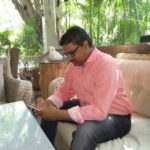 “I would definitely recommend WordPress to other small businesses, particularly to entrepreneurs who have limited or no experience in creating a website from scratch. The platform is so simple to use and comes with an enormous variety of styles and design options, meaning you can create a site that is totally on-brand and incorporates the colours, fonts, and images that you want. “It is easy to update written content, change images, install moving imagery and video, and so much more. It’s also fantastic for SEO, guiding you through meta descriptions, titles, and tags, meaning your website stands a much better chance of performing well in the search engine for your key search terms, driving more business to your site. Still, most of the business owners who responded recommend WordPress, despite those difficulties. Plus, WordPress.com has a 7.8 out of 10 Great score on Trustpilot—a much higher score than almost all other website builders. So most users agree: if you’re up for a little challenge, WordPress might be the way to go. So WordPress has its ups and downs, but it’s up to you to decide if it’s right for your business. To help you get an idea of how it works, we’ll walk you through our basic website build and what stood out to us. We signed up for WordPress’s free plan to begin building. (This did limit our test a bit, but only when it came to the online store, which we’ll address in a moment.) After giving our website a name, we chose a theme. You can find lots of WordPress themes on third-party sites, but we stuck to the provided themes, so we had about 100 free themes to choose from. WordPress also has Premium themes, which are free with higher-tier plans, but those would have run us somewhere between $20 and $150. Then we got to editing, which begins with customizing your theme via the Customizer (intuitively accessible via the “customize” button). We chose a color theme, selected our fonts, and chose how our menus would appear. As we made changes using the left-hand menu, the preview pane on the right showed us how those changes would look. We could even toggle between desktop, tablet, and mobile views to make sure our site would look good on all devices. After all, you don’t want to lose a customer because they can’t read your site on their phone. While the Customizer mostly edits sitewide things like color schemes, menus, and logos, it’s also where we could edit our home page. Given that you edit all your other pages elsewhere in WordPress, this felt confusing. Also confusing, our homepage editing options were limited to inputting text and choosing a featured image. While that worked for our needs, we had expected a few more options. Evidently we would have needed to create a page from scratch for those. 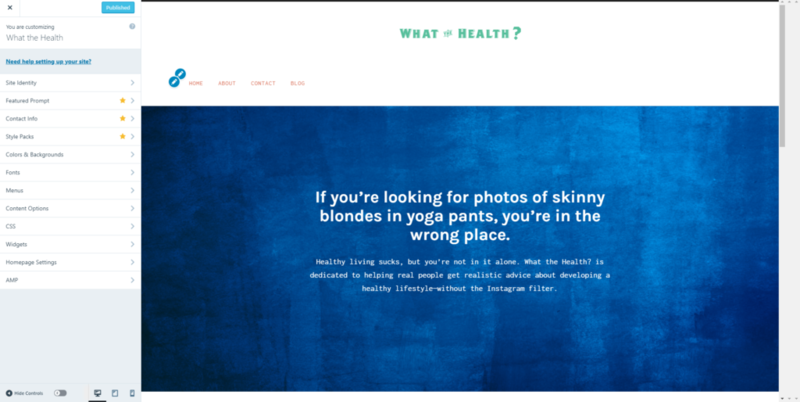 This was a theme-specific issue, though; other themes will give you different options for editing your homepage (and you always have the option of making it yourself). WordPress won’t save your changes automatically; you have to press the “Publish” or “Update” button to save. Don’t forget, or you might lose your work. Once we finished with that, we backed out of the Customizer and began adding pages. This led us to a visual editor where we could add different blocks to assemble our page. But unlike the attractive pre-built blocks you’d find from something like Wix or Squarespace, these are bare-bones blocks. The media and text block, for example, just lets you place an image or video next to some text; there’s no design whatsoever. So creating an attractive page took a lot of work on our part. We had to keep adding and editing blocks, figuring out how to make them look good together. It took a while. And honestly? We liked the results way less than the pages we built with drag-and-drop builders. Still, the basic process wasn’t hard, just time consuming, so we cobbled together an about and contact page in about 25 minutes or so. Then we moved on to the blog. WordPress is all about blogging. Unlike other builders that require you to create a blog via some complicated menu, your WordPress blog exists all along, waiting for you. 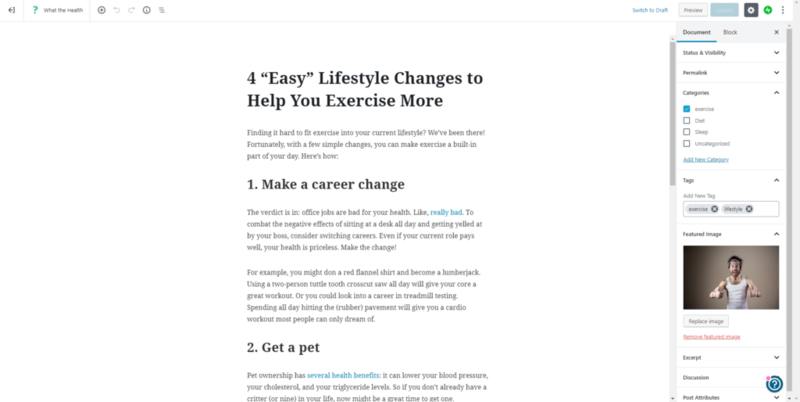 There’s even a shortcut to add a new blog post on your main navigation menu. And just as you’d expect, adding a blog post takes almost no time. You can paste in previously written text, and WordPress keeps all your formatting (a huge time-saver). 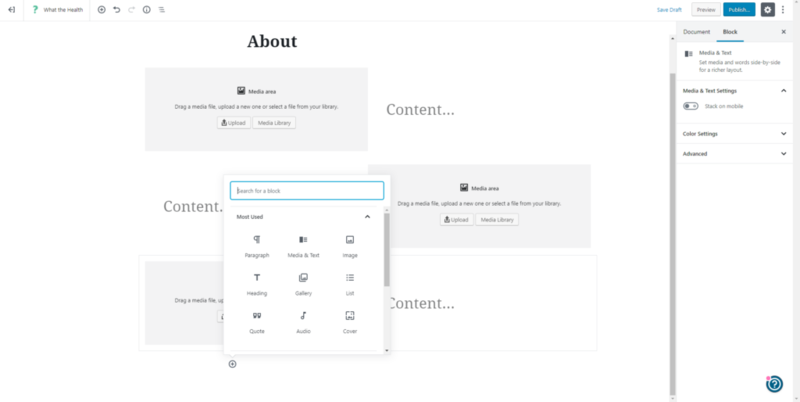 You even have the option to add those content blocks we mentioned, though you probably won’t need them for basic blogging. Our WordPress blog had all the features we expected. 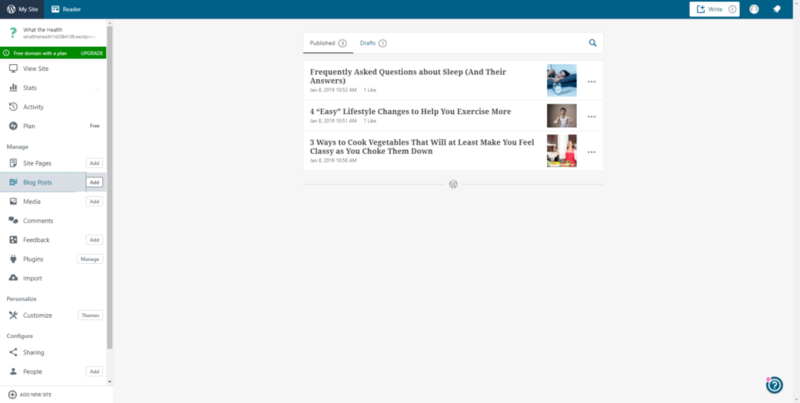 We could add tags to posts and put posts in categories, which makes it easy for readers to find relevant blog posts. We had the option to add featured images and excerpts. We could even schedule a post to publish in the future, so it would go live on our days off. For our test, we published three posts—complete with images and, in one case, a video. Our blog page looked great—very bold, modern, and attention-grabbing. So in just over 35 minutes, we’d created a website with a home page, about page, contact page, and three blog posts. Because we tested the free WordPress plan, we couldn’t create an online store. E-commerce with WordPress requires plugins, which you only get with the top-tier Business plan. We did do our research, though, so we can confidently tell you that, with the right plugins, WordPress can go toe-to-toe with the best ecommerce site builders. The most popular ecommerce plugin, WooCommerce, has all the features you’d expect from an ecommerce builder, from payment gateways to inventory management to product filtering. And that’s just one of the ecommerce plugins available with WordPress. You’ll find a plugin that lets you sell digital downloads, a plugin that lets you sell subscription boxes, a plugin that created limited-time sales, a plugin that—well, you get the point. So while we didn’t get to test an online store personally, we know that WordPress has what it takes to sell your goods. And since WordPress has plenty of retail-specific themes, it can sell them in style. WordPress.com provides a convenient way to take advantage of everything WordPress software has to offer. With the Business plan, you get all the tools and features you’d expect from any site built on WordPress, but without the need to shop around for a separate host or figure out how to install WordPress the software onto a service. The steep learning curve does mean that WordPress might not be the best choice for business owners who just want a small, simple website without much effort. But for businesses that want lots of control and customization, you’d be hard-pressed to find a better site builder than WordPress. Not sure that WordPress is the right fit for your business website? Check out your other options with our list of the best website builders.